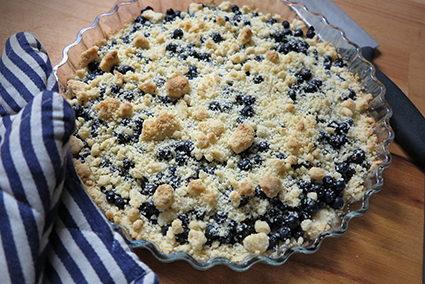 This simple blueberry pie is the classic that my mother-in-law has been serving us for years. 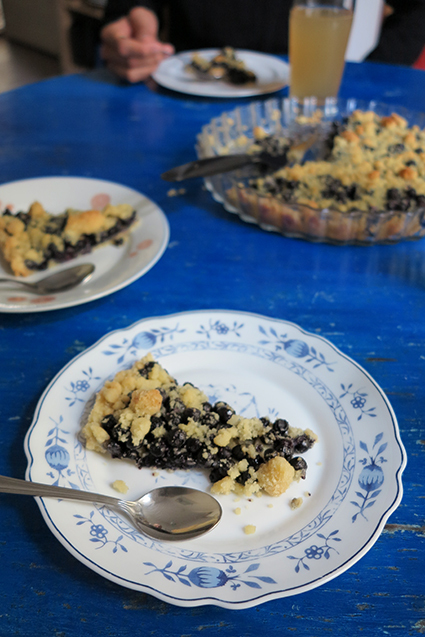 This particular pie was made with hand-picked wild berries brought to us from Finland and it was eaten with hungry Finnish cyclists, visiting us for a few nights while biking in Europe. + enough blueberries (or raspberries, gooseberries, rhubarb...) for a thick layer that covers the whole pie. Melt margarine, stir in the sugar – this is a pretty sweet recipe, so use less sugar if you like. Mix flours with baking powder, baking soda and vanilla sugar and add it to the sugar melt. The result should be crumbly so you might have to add some flour. Press 2/3 of the dough evenly in the dish. Top with your cleaned berries and sprinkle with the rest of the dough.